« Picking the Frozen Four, and the two best teams in the country in the final. Game 1: Islanders at Panthers — Thursday, April 14, 8 p.m.
Game 2: Islanders at Panthers — Friday, April 15, 7:30 p.m.
Game 3: Panthers at Islanders — Sunday, April 17, 8 p.m.
Game 4: Panthers at Islanders — Wednesday, April 20, 8 p.m.
For much of the season, I’ve been on the Florida Panthers bandwagon. Barely on the playoff radar for years, the surging Panthers present a beautiful blend of veteran leadership, notably legend Jaromir Jagr (team leading 66 points), two-way stalwart defenseman Brian Campbell (team leading +31 rating) and ageless goaltender Roberto Luongo (35-19-6, 2.35 Goals Against Average, .922 S.P. ), combined with emerging young talent such as forward Aleksander Barkov (team leading 28 goals) and defenseman Aaron Ekblad. Add to that solid mix some shrewd moves to acquire more depth at the trade deadline by General Manager Dale Tallon catapulted Florida into a real Stanley Cup contender ready to make its first visit to the playoffs in the five seasons a long one. Unlike Florida, New York is trending in the opposite direction. After a few years of moving into the contender category, the Islanders appear on the brink of decline. Still top-heavy, New York features some of the NHL’s best talent, like superstar John Tavaras (team leading 33 goals and 70 points), forward Kyle Okposo (team leading 42 assists) and defenseman Travis Hamonic (team leading 23:49 average time on ice). Veterans like defensemen Johnny Boychuk and Nick Leddy are solid compliments, but the issue here is whether there is enough depth to push this team on an unexpected playoff run. The other concern for the Islanders is their continued issues between the pipes where unheralded Thomas Greiss (23-11-4, 2.36 G.A.A., .925 S.P.) will likely get called upon to put his team on his back. The only advantage New York has in this series is playoff experience, but I doubt that will play much of a factor. This Florida team is simply too good to slip up here, and therefore will win this series in six games. Game 1: Red Wings at Lightning — Wednesday, April 13, 7 p.m.
Game 2: Red Wings at Lightning — Friday, April 15, 7 p.m.
Game 3: Lightning at Red Wings — Sunday, April 17, 7 p.m.
Game 4: Lightning at Red Wings — Tuesday, April 19, 7 p.m. The defending Eastern Conference champion Lightning enter this year’s postseason literally limping due to key personal losses like Steven Stamkos (team leading 36 goals), Victor Hedman (team leading 37 assists and +21 rating) and Anton Stralman. However, a lot of components from last year’s Stanley Cup finals run still remain intact, such as the triplet line of Tyler Johnson, Nikita Kucherov (team leading 66 points) and Ondrej Palat, plus outstanding goaltender Ben Bishop (35-21-4, 2.06 G.A.A., .926 S.P. ), who has carried this team all season. Tampa Bay still plays an exciting brand of hockey, and has a potential X-factor in a motivated Jonathan Drouin, but it will need to overcome depth issues early on the playoffs to go far. Speaking of limping, Detroit figuratively did that by backing into the playoffs for an NHL-best 25th consecutive year under new head coach Jeff Blashill. This postseason marks final hurrah for Russian star Pavel Datsyuk (49 points in 66 games), while follow leaders Henrik Zetterburg (team leading 50 points) and Niklas Kronwall (team leading 22:01 A.T.O.I) are both are nearing the ends of their long and storied careers. Unfortunately, Detroit’s youth movement seemed to take a step back this year, and must step up and carry more of the load to do any damage in the spring. What the Red Wings should be able to rely on is two possible horses in goal in either young up-and-comer Petr Mrazek (27-16-6) or veteran stalwart Jimmy Howard (14-14-5), who will likely to get the nod in Game 1. Despite being a rematch of one last year’s best opening round series, this year’s Tampa Bay/Detroit tilt is the least compelling playoff series this spring. Both teams suffered through subpar years and benefited from a thoroughly weak Atlantic Division. With more to play for and more healthy bodies, I see Detroit upsetting the Lightning in six games. Game 1: Flyers at Capitals — Thursday, April 14, 7 p.m.
Game 2: Flyers at Capitals — Saturday, April 16, 7 p.m.
Game 3: Capitals at Flyers — Monday, April 18, 7 p.m.
Game 4: Capitals at Flyers — Wednesday, April 20, 7 p.m.
All season long Washington has been the NHL’s best team. Coach Barry Trotz guided this veteran group, led by stalwart stars Alexander Ovechkin (NHL leading 50 goals) and Nicklas Backstrom (70 points) to its greatest ever regular season. Standout goaltender Braden Holtby’s (NHL record tying 48 wins, 48-9-7, 2.20 G.A.A., .922 S.P.) is evolving into one of the NHL’s best, and will likely win the Vezina trophy as the league’s top goaltender, while the continued development of future star Evgeny Kuznetsov (team leading 77 points) is a sight to behold. The only question mark for the Washington is whether their blue line, always an Achilles Heel, can hold up under the intensity of the playoffs. The NHL’s most surprising playoff team is Philadelphia, a squad that features elite first line talent, but lacks depth. Thanks to the great work of first-year coach Dave Hakstol, the Flyers are ahead of their original rebuilding schedule, and with the likes of Claude Giroux (team leading 67 points), Wayne Simmonds (team leading 32 goals) and Jakub Voracek, are a dangerous matchup for any team, including Washington. The biggest difference maker for Philadelphia is rookie defenseman, and possible Calder trophy winner, Shayne Gostisbehere (46 points), who is capable of matching up with league’s best blue liners. Per usual the Flyers biggest drawback is in goal, with either Steve Mason or Michal Neuvirth as the possible starters. The NHL’s best team faces one of the league’s hottest in this first round matchup between old rivals. This time around I expect Washington to cruise comfortably in five games with bigger goals in its future. Game 1: Rangers at Penguins — Wednesday, April 13, 8 p.m.
Game 2: Rangers at Penguins — Saturday, April 16, 3 p.m.
Game 3: Penguins at Rangers — Tuesday, April 19, 7 p.m.
Halfway through the season the ice was thin in Pittsburgh as the Penguins were floundering, playing uninspired hockey and sitting significantly outside of the playoffs. However, a coaching change that brought in Mike Sullivan combined with an organizational philosophy change to play a more up-tempo brand of offensive game resulted in one of the league’s better second half stories. Led by a resurgent Sidney Crosby (team leading 36 goals and 85 points) and possible Norris trophy defenseman Kris Letang (teaming leading 51 assists and 26:57 A.T.O.I. ), these Penguins play fast and loose, and are a scary matchup for any opponent. Thanks to the additions of Trevor Daley and Justin Schultz, two successful reclamation project defensemen, Pittsburgh’s blue line and transition game is much improved as well. If Evgeni Malkin (58 points in 57 games) can return healthy at some point during the postseason, this is a potential Stanley Cup finalist. New York endured a roller-coaster of a regular season. After an inspired, and unusually fast start, the Blue-shirts slipped into mediocrity for much of the season, thanks to being saddle with a roster that was already thin due to salary cap constraints end up decimated by injuries. Still there are plenty of winning pieces here, notably all-world goaltender Henrik Lundqvist (35-21-7, 2.48 G.A.A., .920 S.P.) and nice talent up front led by Derek Stepan, Derick Brassard (team leading 27 goals) and Mats Zucarello (team leading 61 points). Unfortunately, the Rangers are moving the wrong direction fast due to its aging blue line, but two veterans, Eric Staal and Rick Nash may still be able to carry the team when called upon to do so. This should be a fantastic first-round series, and is probably the best match up (at least on paper) in the East. Two very fast teams will compete in a track meet, but I expect Pittsburgh’s overall talent to win out, even if Lundqvist plays like his stone wall self. Pittsburgh will advance in six games. Pittsburgh beats Washington in seven games; Florida beats Detroit in five games. Pittsburgh beats Florida in six games. Game 1: Wild at Stars — Thursday, April 14, 9:30 p.m.
Game 2: Wild at Stars — Saturday, April 16, 8 p.m.
Game 3: Stars at Wild — Monday, April 18, 8:30 p.m.
Game 4: Stars at Wild — Wednesday, April 20, 9:30 p.m.
I’m proud to say that I predicted Dallas’ bounce back season before the year began. Then again, I also picked Columbus to make the playoffs, but the Stars certainly exceeded my and most pundits’ predictions. Dallas is far better than they were in 2014-15 this season due to improved goaltending and most importantly a vastly better blue line, led by former Chicago stalwart Johnny Oduya. Where the Stars cause any opponent matchup fits is on offense, where the combination of Jamie Benn (team leading 41 goals and 89 points) and Tyler Seguin (73 points in 72 games), plus other snipers like Jason Spezza and defenseman John Klingberg (team leading 48 assists, +22 rating), are a handful to deal with. Minnesota posted one of the worst point totals in recent history to grab the final Western Conference playoff berth, yet this is another dangerous wild-card entry. This Wild team has solid leadership, proven playoff performers like Zach Parise (team leading 25 goals, but who may miss some of the series due to injury) and defenseman Ryan Suter (team leading 28:36 A.T.O.I. ), plus a goaltender capable of stealing a series in Devan Dubnyk (32-26-6, 2.33 G.A.A., .918 S.P. ), something Dallas doesn’t feature, which is an element where the Wild will have a huge edge over heavily-favored Dallas. As the Dallas Stars continue to mature, I expect them to become one of the NHL’s best teams for the foreseeable future. Yet, at the moment they are very untested in the playoffs. Meanwhile, Minnesota is plenty playoff tested, and used to overcoming below average regular seasons. Therefore, I like the Wild for a seven-game upset in this opening round series. Game 1: Blackhawks at Blues — Wednesday, April 13, 9:30 p.m.
Game 2: Blackhawks at Blues — Friday, April 15, 8 p.m.
Game 3: Blues at Blackhawks — Sunday, April 17, 3 p.m.
Game 4: Blues at Blackhawks — Tuesday, April 19, 9:30 p.m.
St. Louis enters the playoffs hot, but banged up, having been hit hard all season by the injury bug. If the Blues were more near 100% all season long, they likely would have outlasted Dallas to win the Central Division. Instead, their prize for finishing second in the NHL’s toughest division is another matchup with archrival Chicago. After years of short playoff runs, this could be the last go around before wholesale changes for captain David Backes and several of the team’s veteran blue liners. Actually on defense is the one aspect where St. Louis should have a distinct advantage in this series. Super sniper Vladimir Terasenko (team leading 40 goals and 74 points) will also have to be in top form matching up against Chicago’s superior offense, while Alexander Steen (52 points in 67 games) needs to be at his best to counteract the Blackhawks’ elite two-way play. The Blues other big question mark is in goal, where both Brian Elliott (23-8-6, 2.07 G.A.A., NHL’s best .930 S.P.) and Jake Allen (26-15-5) had outstanding seasons, but their playoff track records leave little to be desired. After winning the Stanley Cup last season, Chicago retooled and built a roster arguably stronger than last year’s version, led by likely NHL MVP Patrick Kane (NHL best 106 points), rookie sensation Artemi Panarin (77 points), captain Jonathan Toews, and its usual core of stellar minute chewing defenseman led by Duncan Keith (team leading 25:14 A.T.O.I.). Due to a reckless suspension Keith will miss the first game of this series, leaving even more work on the hands of underrated goaltender Corey Crawford (35-18-5, 2.37 G.A.A., .924 S.P. ), who is coming off of his best ever season, and fellow defensive standout Brent Seabrook. Add into the mix newcomers Dale Weise and repatriated Blackhawk Andrew Ladd, and this team is a dangerous as it’s ever been, even if many of the names have changed from a year ago. This series should be a classic with two historic rivals facing off yet again in the playoffs. Chicago should be most vulnerable in the first round, where they’ve had a series of close series wins in the past, but until they prove it on the ice, it’s almost impossible to pick the Blues over the Blackhawks or anyone else for that matter. Therefore, I will take Chicago in seven games. Game 1: Predators at Ducks — Friday, April 15, 10:30 p.m.
Game 2: Predators at Ducks — Sunday, April 17, 10:30 p.m.
Game 3: Ducks at Predators — Tuesday, April 19, 9:30 p.m.
Game 4: Ducks at Predators — Thursday, April 21, 8 p.m.
After a miserable start to the season the Ducks regrouped, changed styles and became the NHL’s best team in the second half, even arguably better than Washington, which ran away with the Presidents’ trophy. The Ducks feature everything you could want in a Stanley Cup contender, notably not one, but two solid young goaltenders in John Gibson (21-13-4) and Frederik Andersen (22-9-7), a talented, veteran offensive crew led by Corey Perry (team leading 34 goals), Ryan Getzlaf (team leading 50 assists, 63 points), and shutdown specialist Ryan Kesler, plus a young and extremely deep blue line. Over the past three playoff campaigns, Anaheim has advanced one round further each spring, meaning if that trend continues, this year they will be playing for the Stanley Cup. The Nashville Predators are not a usual wild-card team, making the playoffs comfortably with a roster stockpiled with players capable of a deep playoff run. But because they compete in the Central Division, where the three teams that finished with better records, Nashville gets to crossover and face Cup-favorite Anaheim. The Predators are one of the few teams that match up with the Ducks on the blue line even without the traded Seth Jones, thanks to their amazing one-two punch of Shea Weber (51 points) and Roman Josi (team leading 47 assists, 25:29 A.T.O.I.). After being swapped for Jones, a rejuvenated Ryan Johansen (34 points in 42 games with the Predators) provided instant offense since joining his new squad, helping this formerly moribund crew become much deeper and much more dangerous. He slots in nicely alongside second-year standout Filip Forsberg (team leading 33 goals and 64 points), stellar two-way center Mike Fisher and sniper James Neal. Anaheim’s reward for winning the Pacific Division is avoiding L.A. and San Jose until the second round, but Nashville will hardly be considered a cakewalk in the appetizer course. If the Ducks play like they did in the first half of the season, the upset alert will out in full force, but I think Anaheim has too much fire power and should survive in six grueling games. Game 1: Sharks at Kings — Thursday, April 14, 10:30 p.m.
Game 2: Sharks at Kings — Saturday, April 16, 10:30 p.m.
Game 3: Kings at Sharks — Monday, April 18, 10:30 p.m.
Game 4: Kings at Sharks — Wednesday, April 20, 10:30 p.m. In the last two even years of the playoffs Los Angeles won Stanley Cups. After getting plenty of rest during the turmoil of last season which resulted missing out on the playoffs entirely, the Kings are poised for a deep run yet again. Whenever Jonathan Quick (40-23-5, 2.22 G.A.A., .918 S.P.) takes the ice as your goaltender, that team has a shot to win a title. Plus the Kings will feature a formidable veteran lineup in front of him, led by stars Anze Kopitar (team leading 74 points) and likely Norris trophy-winning defenseman Drew Doughty (51 points, 28:01 A.T.O.I.). G.M. Dean Lombardi shored up some holes during the season with the additions of Luke Schenn and 2004 Cup Winner Vincent Lecavalier, but this team’s overall depth, especially on defense, is still a concern. Like Los Angeles, San Jose returns to the playoffs after a surprising one year hiatus. The veteran Sharks continue to retool, notably grabbing former Kings prospect Martin Jones (37-23-4, 2.27 G.A.A., .918 S.P.) to carry the mail in goal. Captain Joe Pavelski (team leading 38 goals) had another strong year and is now the team’s unquestioned leader, but don’t overlook the amazing second half Joe Thornton (team leading 82 points, playoff best 63 assists) put in. Fellow longtime Sharks forward Patrick Marleau also had a strong campaign, but 2015-16 marked the breakout campaign of Brent Burns, who as a defenseman posted a 27-goal and 75-point season. This San Jose team, which is still haunted by memories of blowing a 3-0 series lead against Los Angeles in 2014, will get the rematch they’ve craved for two years in this titanic first round clash. The question is whether the Sharks can overcome the demons of that horrible collapse. This should be an awesome series, big boy hockey out west, as the physical Kings will knock heads with the speedy Sharks. Expect one or the other to be banged up when this series finishes, but well tested and potentially ready for a deep run. I like Los Angeles to prevail in a seven-game grudge match. Los Angeles beats Anaheim in seven games; Chicago beats Minnesota in five games. Los Angeles beats Chicago in six games. 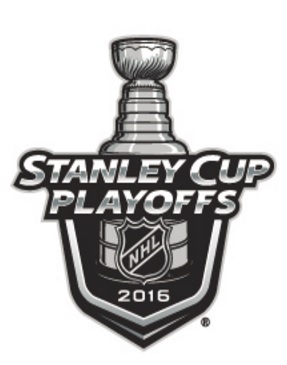 I predict the Los Angeles Kings to win their third Stanley Cup in five years with seven-game series victory over Pittsburgh.